The northern Costa Blanca is fast becoming the ‘go to’ place on mainland Spain and offers the perfect combination of local tradition, fine cuisine, stunning coastlines and breathtaking mountains. Situated on the Mediterranean, it gives us more than 300 days of sun a year - no wonder it’s so popular. Established over 20 years, the team at Garcia Villas are committed to providing a hassle free, fully comprehensive personal service and like us, you, the customer, are at the heart of everything they do. We are delighted to partner with Garcia Villas to help you buy your dream property in Spain. Alicante-Elche Airport connects the northern Costa Blanca to and from over 110 destinations worldwide and the high-speed AVE train and motorways provide excellent connections to coastal and inland destinations. The northern Costa Blanca costal resorts boast the most ‘Blue Flag’ beaches in Spain and offer a multitude of water sport activities as well as 170 beaches and coves to explore. Restaurants, shops, marinas and a variety of nightlife venues – suited to all tastes - add another enviable dimension to the area. Known for it’s cuisine: there are gastronomic events all year round and the area holds a prestigious 10 Michelin stars. Annual fiestas have international appeal and the much visited wine route offers more than 16 vineyards to add to your bucket list. The Costa Blanca is also one of the most mountainous regions of Spain with more than 450km of hiking routes and is renowned for being a cycling haven. It is also centre for international sporting events such as the Volvo Ocean Race and the Vuelta Ciclista a España. Inland towns and villages have well preserved traditions and typical cuisine. This area enjoys a rich history and culture with more than 100 castles and historic sites to visit. The area also is very much ‘open for business’. There are more than 60.000 places for meetings and seminars and with quality facilities close by this makes the area an ideal destination for incentive and team building trips. Quality of life is at the heart of the region: not only because of the Mediterranean diet and climate, wide variety of sports on offer - including access to 23 golf courses - but, the area is also internationally acclaimed for its health infrastructure and high standard of medical and dental care. All of which make it an ideal destination whether you are relocating or looking for your dream holiday home. We are confident Garcia Villas will go the extra mile to ensure you have the best possible buying experience in Spain. We will be with you every step of the way: sorting you an English speaking lawyer* and making sure your property purchases goes smoothly. We have also forged long standing relationships with a fully regulated money transfer company and trusted mortgage brokers should you need financial advice and help. Decide exactly what you want – are you looking to move, invest or for a holiday home? Decide your budget – as a rule you need to allow an additional 12% to cover various taxes and legal fees. Get to know the area – pictures will never give you the full information you need. Visit the area, speak to the locals and don’t be tempted into making quick decisions. The first place to start is on the internet. Garcia Villa’s website makes your search very easy. They offer a wide selection of sensibly priced properties to suit all tastes and budgets. The Costa Blanca is only a short flight away. Our colleagues at Garcia Villas will be delighted to show you around and are happy for you to visit the property as many times as you like until you are 100% sure you are ready to start the buying process. Decide on the offer you wish to make and then leave the rest to us. Once an offer is accepted, terms are agreed and this needs to be formalized by way of agreement and the payment of a deposit (this can vary but is normally around 3000€) this secures the property, ensures it is taken off the market and initiates searches. You will need to open a bank account – a very simple procedure – then your lawyer will ask you to sign a private purchase contract. At this stage 10% is paid directly to the property owner. At this point your lawyer will organise the transfer of utilities, rates and any community charges and the date for completion is set. This takes place in the local notary’s office where all the official deeds are signed. You will be issued a copy of the deed and you are then the proud owner of your very own property in Spain! * Professional and Legal Advice – not only will they take care of all legal matters, they will also assist you in obtaining an NIE number (which is required by law prior to purchasing any property in Spain). Completely renovated to an exceptional standard with no expense spared, this spectacular Villa is tastefully finished and located on one of Javea´s most exclusive estates, La Lluca. Constructed on a flat, south facing plot with one neighbour and right on the edge of the Granadella national park, this house is immaculately presented. Within a short drive Javea´s golf club, beaches and the international school, this villa will appeal to the buyer looking for a modern villa with a traditional feel. Entrance to the property is via automatic gates onto a large parking area with covered parking and a welcoming front door. There is also a pretty doorway directly to the Naya, terraces and 10x5m pool. The hallway opens to a large open plan living area with vaulted ceilings, feature fireplace, open plan, custom made kitchen and access via the patio doors directly to the newly tiled terraces and landscaped gardens with mature palms, manicured lawns and citrus fruit trees. In total, the house comprises of 4 double bedrooms, three bathrooms, living, dining and kitchen area all on one level and an under build with a utility or storage space. The entire property is double glazed, centrally heated and air conditioned. 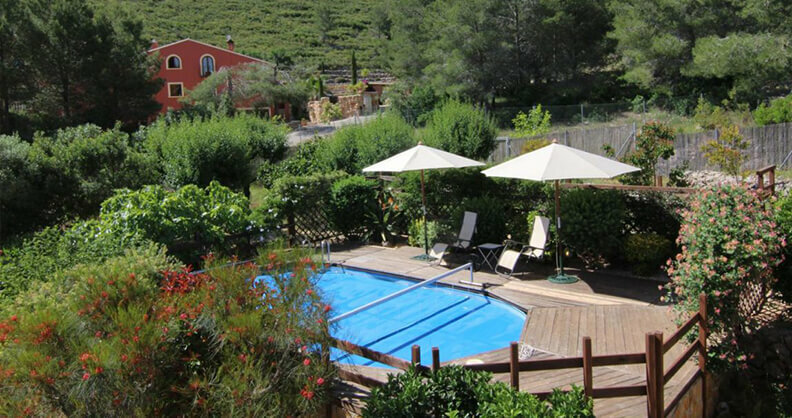 A beautifully finished 5 bedroom property in sought after urbanisation in Jalon. The property comprises of 3 bedroom villa with 2 bedroom apartment in the under build. The villa features an off street parking space at street level, descending via a flight of stairs to the main front door and enter the property into an entrance hall, leading to the living/dining room with open plan kitchen. Separate doors lead off to the three bedrooms, one with an en-suite bathroom and another door to the family bathroom. A door leads out to the sun-trap terrace with incredible open views of the Jalon valley. An external flight of stairs descends to the pool terrace and the entrance to the very tastefully decorated 2 bedroom guest apartment with one bedroom featuring an en-suite, plus another family bathroom with additional door to allow pool users in directly from the pool terrace, without entering via the apartment. There is also a large storage room could be used as an additional bedroom. This stunning, modern villa with panoramic sea views can be built on a selection of ready plots within vaious locations for the advertised price. All properties are contructed to a contemporary design comprising of 4 double bedroom, three bathrooms and a large, open plan living room and American kitchen. Each properties finishes can be tailored to suit individual tastes and construction take about 12 months. Constructed by a local, established constructor, there are show houses available to view before making your choice. Please feel free to contact us to arrange viewings. An impressive, modern three bedroomed, three bath roomed detached country villa peacefully located on the outskirts of the traditional village of Lliber amongst beautiful countryside. Style and quality are in abundance in this immaculately presented two storey property. Set on a south-east facing, the enclosed plot has ample parking for several vehicles including shaded parking. Steps lead from the parking area to a beautiful private terrace with adjoining summer kitchen, barbeque and covered dining area, ideal for entertaining purposes. Outside is a Naya /summer kitchen with barbecue and spare washing machine. The mature garden has almond, orange, fig, apricot and nispero trees and a complete watering system waters all the plants and pots front and back.